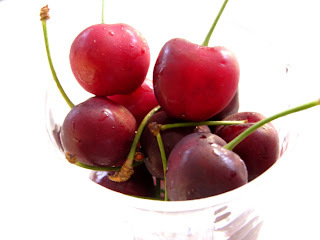 For now I will show you how to pit cherries without any special gadgets, and give you a quick recipe for cherry puree that will make a great addition to ice cream or your next vodka Collins. Get an oversized paperclip and wash/sterilize it. Bend it (so that you have two little hooks on each end) by pulling the center out like opening a book. Now you have a cherry pitter! 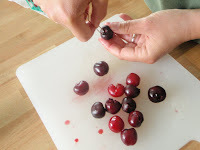 Remove the stems from all of your cherries. 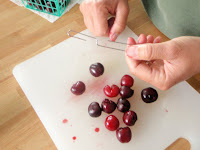 Take a cherry and use the smaller end of the paperclip to slowly but firmly press into the cherry where the stem once was. Get the hook around the pit and fish it out. Get spouse to bake something. remove the pits without too much cosmetic damage to the cherry. 1. Put all ingredients in a blender and process until smooth. 2. Strain mixture through a fine mesh strainer to remove skins, etc. 3. Store in the refrigerator for up to a week. Intro photo by Alpha Cook, action photos by Beta Wife. Wow! 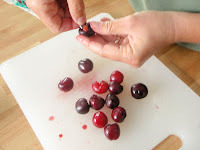 I never would have thought to do this - I always end up mutilating the cherries while trying to pit them. It's amazing that a simple office supply can perform such a great task in the kitchen! This is so cool! 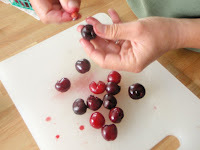 I just posted a recipe for Fresh Cherry Turnovers, and we were so excited to use our OXO cherry pitter. This is a fine alternative! There is also a guy at 53rd and San Pablo out there almost everyday selling cherries! Five bucks for three pounds!